For more information and to register, go to Artisan Army. 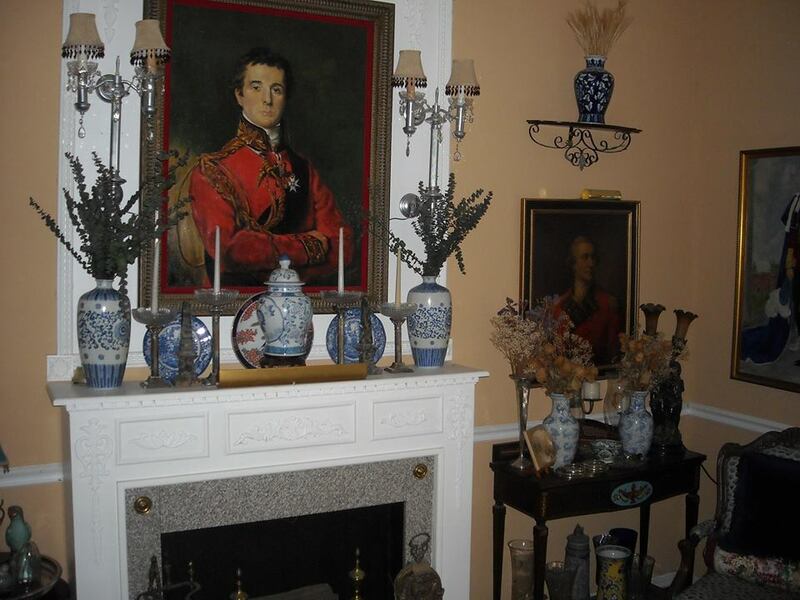 Join the Historic Hernando Preservation Society as we start 2019 off right with guest speaker Roger Sherman who will talk about period interiors and decorating with antique furniture. While now retired, Mr. Sherman was a state licensed and professional member of ASID, and lectured at Hillsborough Community College on Interior design. We will also be awarding the Lee Anne Shoeman Preservation Award during the January meeting. Please join us for our 4th quarter business meeting and holiday potluck supper party. We will be holding elections for the 2019 officers and board members and voting on the LeeAnne Shoeman Preservation Award nominees. There will also be a small fundraising auction. Please bring a small, inexpensive wrapped Christmas ornament for a fun gift exchange. 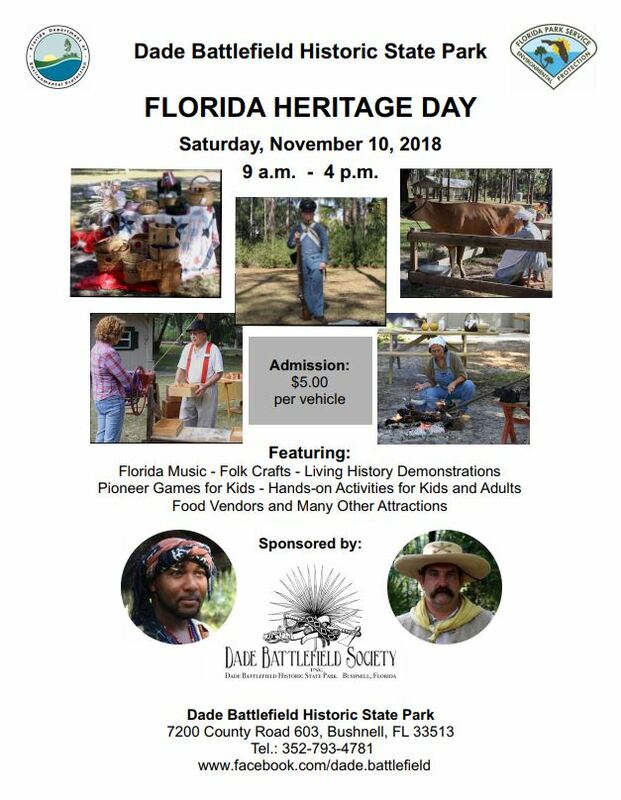 Presented by the Florida Humanities Council in partnership with the Historic Hernando Preservation Society, we are pleased to welcome historian Betty Jean Steinshouer as our November featured speaker. Experience Florida through the milieu of three woman authors, Harriet Beecher Stowe, Marjorie Kinnan Rawlings, and Marjory Stoneman Douglas. Each wrote a book that put Florida on the map- in 1873, 1938, and 1947 respectively. Performed in character & costume by Betty Jean Steinshouer. 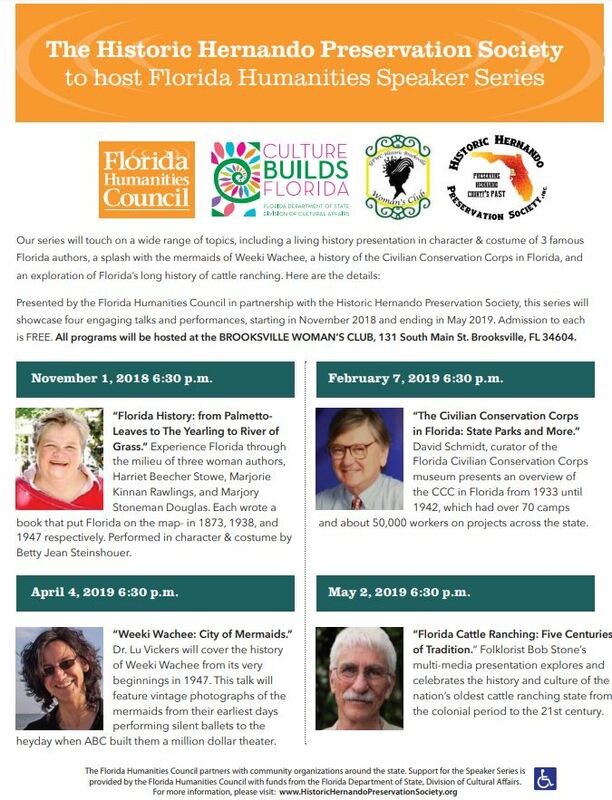 Don’t miss our 2018-2019 Florida Humanities Speaker Series, featuring fascinating programs about Florida’s history, culture, and people. 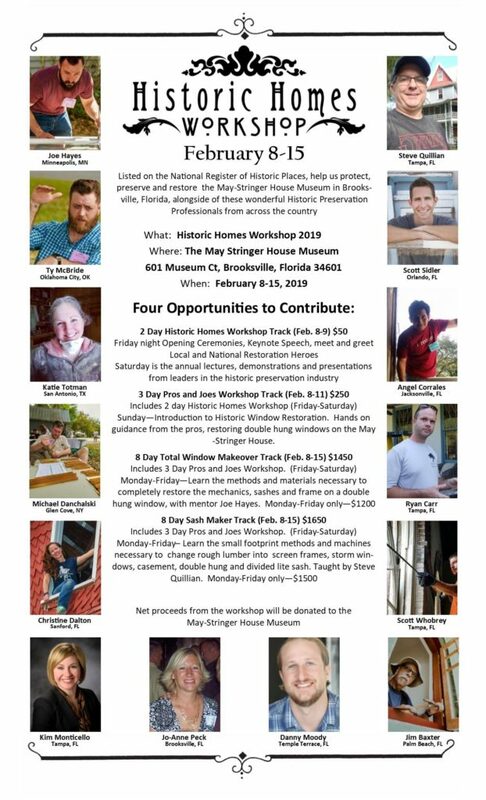 Presented by the Florida Humanities Council in partnership with the Historic Hernando Preservation Society, this series will showcase four engaging talks and performances, starting in November 2018 and ending in May 2019 . Admission to each is FREE. All programs will be hosted at the Brooksville Woman’s Club, 131 South Main St. Brooksville, FL 34604. 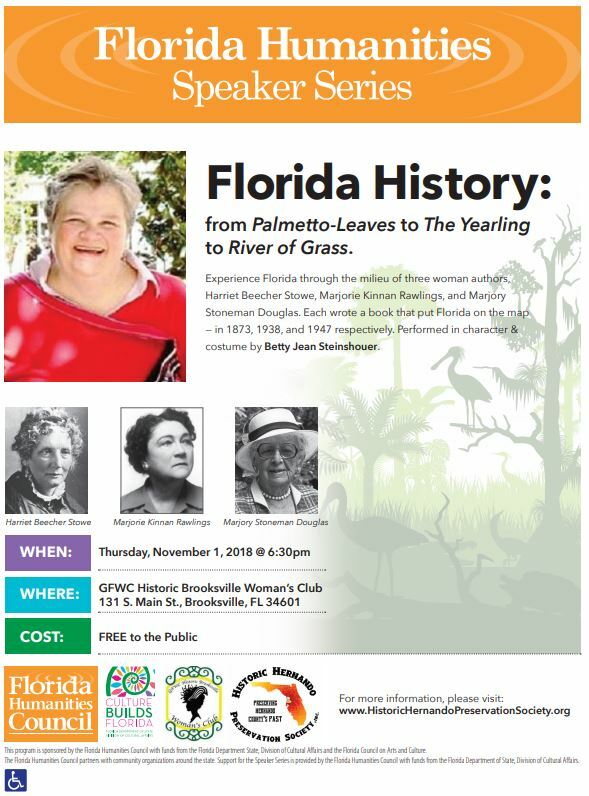 November 1, 2018 6:30 p.m. “Florida History: from Palmetto-Leaves to The Yearling to River of Grass.” Experience Florida through the milieu of three woman authors, Harriet Beecher Stowe, Marjorie Kinnan Rawlings, and Marjory Stoneman Douglas. Each wrote a book that put Florida on the map- in 1873, 1938, and 1947 respectively. Performed in character & costume by Betty Jean Steinshouer. 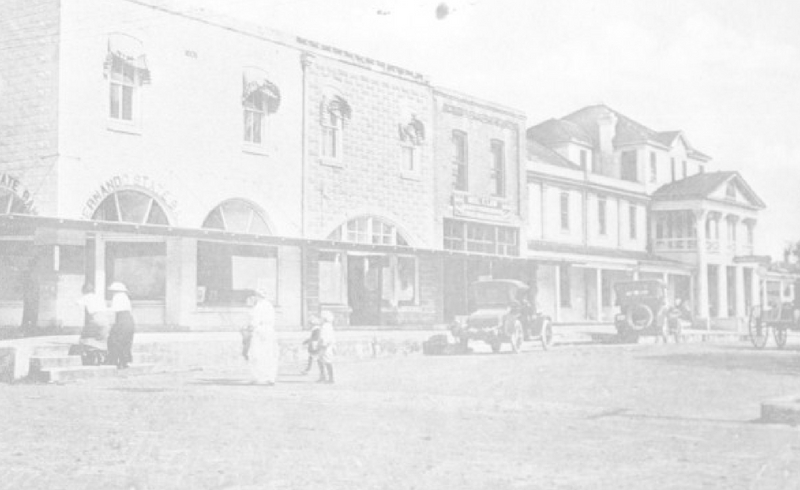 February 7, 2019 6:30 p.m. “The Civilian Conservation Corps in Florida: State Parks and More.” David Schmidt, curator of the Florida Civilian Conservation Corps museum presents an overview of the CCC in Florida from 1933 until 1942, which had over 70 camps and about 50,000 workers on projects across the state. April 4, 2019 6:30 p.m. “Weeki Wachee: City of Mermaids.” Dr. Lu Vickers will cover the history of Weeki Wachee from its very beginnings in 1947. This talk will feature vintage photographs of the mermaids from their earliest days performing silent ballets to the heyday when ABC built them a million dollar theater. May 2, 2019 6:30 p.m. “Florida Cattle Ranching: Five Centuries of Tradition.” Folklorist Bob Stone’s multi-media presentation explores and celebrates the history and culture of the nation’s oldest cattle ranching state from the colonial period to the 21st century. The Florida Humanities Council partners with community organizations around the state. Support for the Speaker Series is provided by the Florida Humanities Council with funds from the Florida Department of State, Division of Cultural Affairs. 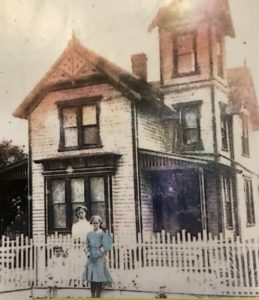 The Historic Hernando Preservation Society is pleased to welcome historic preservation consultant, Jo-Anne Peck to speak on “Researching Your Home’s History”. Ms. Peck will talk about what to look for, where to look for information and why it is good to know the history of your house or building. The talk is free and open to the public. 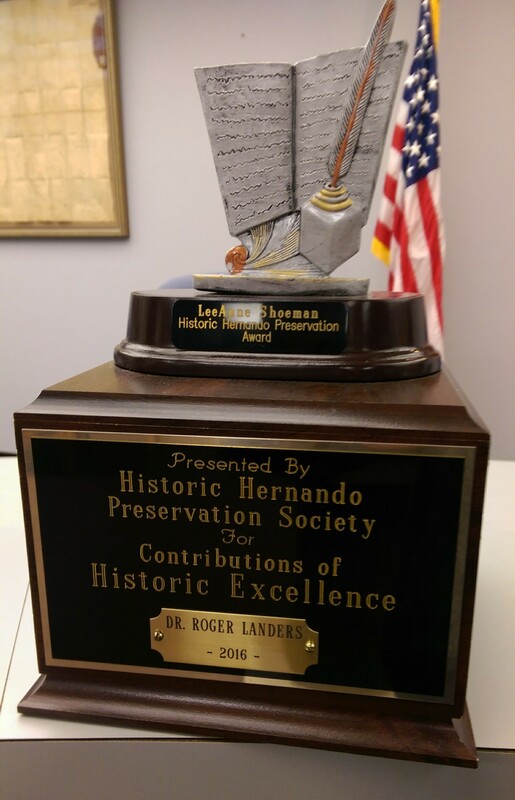 The Lee Anne Shoeman Preservation Award is presented annually to a person who as contributed to understanding of the historic significance of Hernando County, and or furthering historic education in Hernando County. It is named in honor of Lee Anne Shoeman, a gifted educator and historian. The award serves as a beacon of hope that the work of Ms. Shoeman will carry on with those of us who love history and wish to continue the memory of a beloved historian, writer and educator. 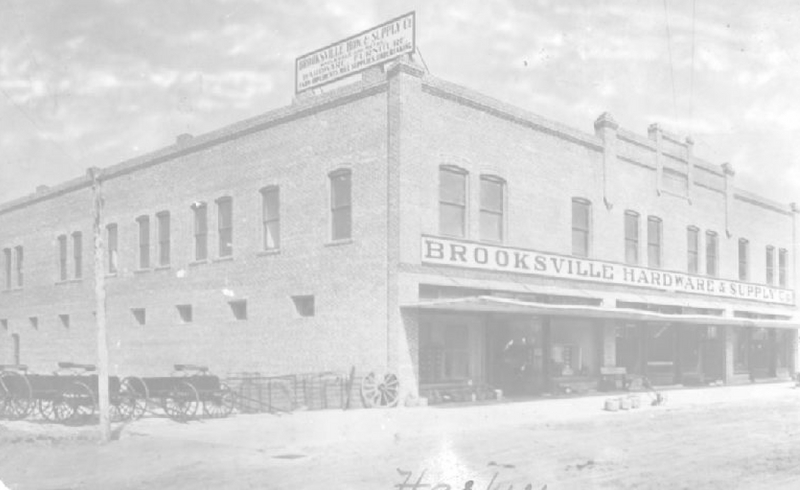 The award is displayed in Brooksville City Hall​. Nominations are due by November 1, 2018. 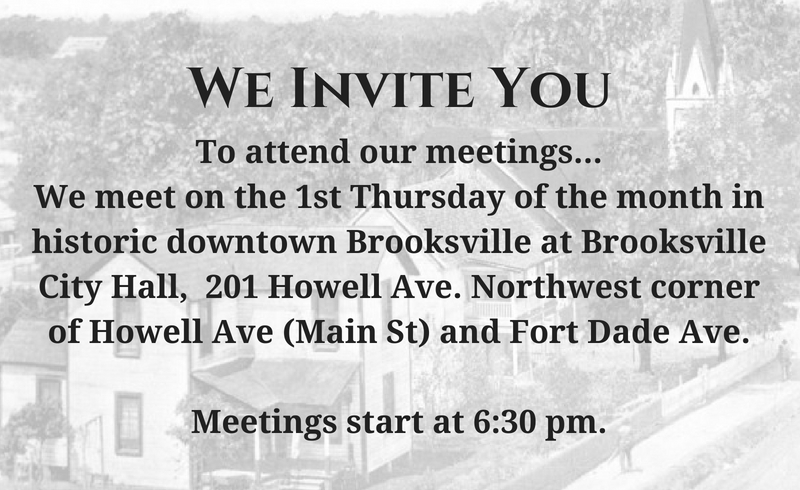 Be a part of the revitalization efforts in Historic Brooksville. And have fun while doing it! It truly takes a village to produce the Friday Night Live Concert Series here in downtown Brooksville.